Everything is organised isn't it? Well I still have to collect the magazine from the printer. What! But the launch is in a few hours. No problem. I just have to drive up to Blanchardstown and collect them. Have you made out the readers' list? I'm not quite sure who's coming. Oh dear. And you have an introduction ready for Noel French who is launching the issue. No our chairman does that. Your chairman is gone to San Francisco. San Francisco! That's a bit drastic. It's not that difficult to introduce Noel French. We'll see how well you can do it so. Ok, Ok, Make me a cup of coffee, yes another one, going to be a busy day. I'll do everything in plenty of time for the next issue. The Viaduct Bards presents readings from local poets and writers on the last Wednesday of each month. This months special guests are poets John O'Rourke and Nuala Leonard. The eight issue of Boyne Berries, the magazine published by Boyne Writers will be launched on Thursday 30 September at 8pm in the Castle Arch Hotel, Trim by Noel French of the Meath Heritage Centre. 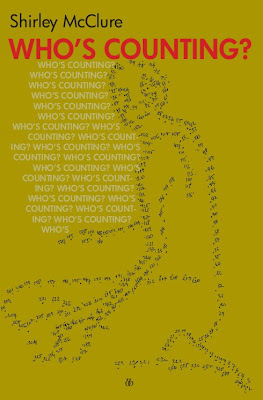 This issue of the magazine continues the pattern established by the previous issues and includes prose and poetry from local and international writers. Members of the Boyne Writers are included, Anne Crinion has two poems on aspects of Trim as it once was, Caroline Finn contributes a fictitious newsletter from a mysterious character called Hank, Jenny Andersson writes about her garden, Bill Comerford about primroses in a window box and Barbara Flood has thoughts about the summer just gone by and how Irish people react to the weather. Rory O’Sullivan of the Boyne Writers Group has one of his typically dark mysterious poems included with his own evocative illustrations. This issue has poems and prose from writers in the UK, the USA, Canada, Italy and India. There are pieces about love lost and found, about life and death, about the past and the future. It is full of pieces which have unexpected twists and turns. A poem by Canadian resident Changming Yuan called On the Recycling Day lists contents of bins which are not what might be expected! On the other hand a poem called “Visa Photo” by Marian O’Rourke has a first line we might all empathise with as we look at a passport photo taken some years ago: The face in the photo is not mine. A sample of some of the titles gives a hint of the variety of reading which is contained in the magazine: I Lied about Being the Indoor Type, A Love Affair with Horse Racing, and I Don’t Buy Marmalade Anymore. At the launch many of the contributors will read their work. Admission is free and all are welcome. Previous launches have been very enjoyable occasions and have been very well attended. No matter how interesting it is to read work in a magazine, hearing the author read is a special pleasure. You can chat to the writers over a tea or coffee afterwards. Boyne Berries 8 costs €7 and will be on sale in Antonia’s Bookshop, Trim and other local outlets or can be purchased through the website. More pictures from Saturday's event in Sligo. 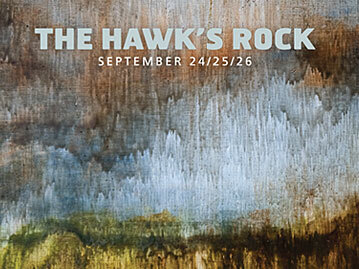 Me admiring my Hawk's Rock chapbook at the shed gallery with the Hawk's Rock in the background. One of Conor Gallagher's paintings of the rock. This picture doesn't do justice to the painting's bright vibrant colours. Conor used a black and white version of this for the chapbook cover. The musicians play The Hungry Rock. The view from the summit of the rock back towards the shed gallery. 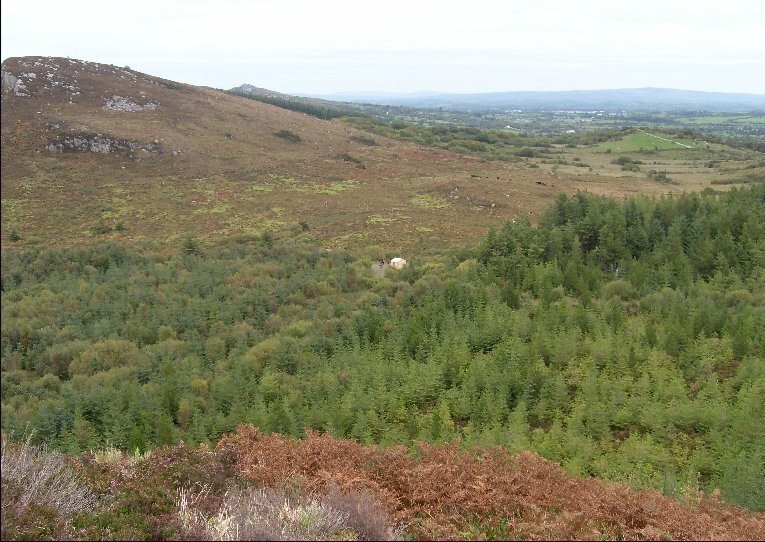 There is a photograph of the rock from the road, the usual viewpoint and the one which Conor's paintings reflect, on this page. 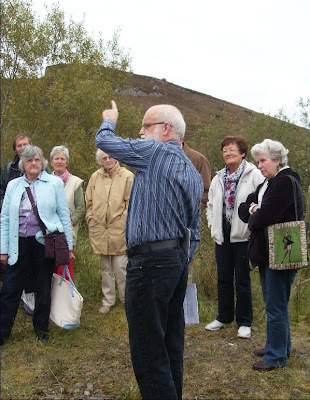 Very enjoyable and special event at the Hawk's Rock, Coolaney, Sligo yesterday. 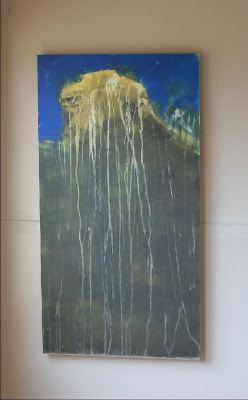 I was delighted to be asked to play a part in Conor Gallagher's exhibition of his paintings of the rock, an impressive steep outcrop on the southern side of the Ox Mountains. 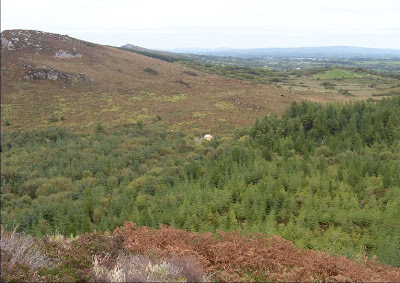 This place and Tullaghan Well nearby gave Yeats the title of his play At the Hawk's Well. Conor performed miracles, got Coillte to clear a path to the top of the Rock allowing the visitors to climb and enjoy the view - all of south Sligo and Benbulben, Sligo Bay and the Donegal mountains to the north. He had a hut built near the Rock in which he exhibited his paintings, asked me to speak of the history of the area and read some poetry and had a couple of musicians there who played the Dervish tune The Hungry Rock. He made my collection of six poems on the area into a very attractive chapbook which we gave out to the audience. A good crowd made up I think of some from Sligo town and some locals enjoyed the event. I got some compliments on the poetry and and the history as well as some additions to the stories associated with the area. The weather was perfect, a calm clear autumn day and the mountain was dry underfoot. 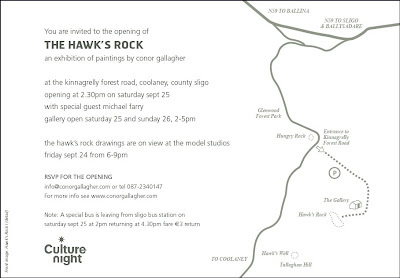 Conor's gallery at the Hawk's Rock is open again today 2pm - 5pm and he will have more on the exhibition on his website later. Pictures. Top: Conor Gallagher welcoming everybody. Below: Me pointing out the local landmarks. Labels: Hawk's Rock; Coolaney; Sligo; Conor Gallagher; Tullaghan. All Ireland Poetry Day takes place on Thursday 7th October and events will take place in most if not all counties of Ireland. Boyne Writers Group have organised a reading in St Patrick's Cathedral, Loman Street, Trim at 12 noon and one in the Resource Centre, Kells at 5pm. All are welcome to come along and read a favourite poem, one of your own poems or just listen. Picture above is of Frank Murphy reading in the Cathedral last year. A wonderful venue! LitLab, of which I am also a member, are reading at the Chapter 1 Cafe at 8pm that evening and we are also having a reading in Virginia but the time has not been finalised yet. I'm off to the Hawk's Rock to day to talk (briefly) about history, read a few poems, look at Conor Gallagher's art and admire the wonderful Ox Mountain scenery. I had given up on Dromineer because I heard last week who had won the competition. Today I got an email saying that "Dave Lordan, the judge of the Poetry Competition at the 2010 Dromineer Literary Festival, has selected the following works for special merit" and two of my entries were included. I'm pleased about that - nice to be noticed. I'll probably go down for the presentations and stay for the Dave Lordan workshop the next morning. I was talking or emailing two people recently about choosing poems to enter based on who the judge was and I have to admit that I chose my Dromineer entry with Dave in mind. however the one I though would really catch his attention isn't in the merit list. Ah well. We also had a discussion recently about putting titles on poems to catch the judges attention. Just as a matter of interest this is the list of Dromineer special merit titles. What do you think? By the way can you guess which two are mine? I thought about not renewing my subscription to the American magazine Poetry but I've just got the September issue and I'm enjoying it so much I may even send the money. I read the reviews and the comment section first then the poetry. I mentioned here recently a wonderfully opinionated review in Poetry Ireland Review and there's something similar in the issue of Poetry in a review of a new collection by Robert Hass a Pulitzer Prize winning American poet who served as Poet Laureate of the U.S. from 1995 to 1997. 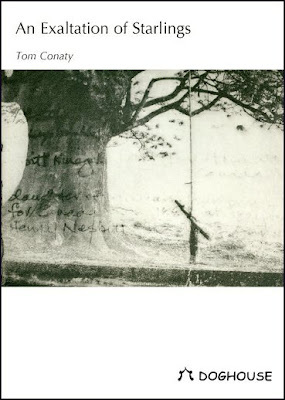 The review by Michael Robbins of The Apple Trees at Olema: New and Selected Poems, by Robert Hass has a iconoclastic tone, unafraid to criticise Hass and have a few swipes at other pillars of the American poetry on the way. It's not a negative review, he does praise where he considers praise is due. Like Mary Oliver, Billy Collins, and Sharon Olds—in their different ways—Hass has made a career out of flattering middlebrow sensibilities with cheap mystery. Unlike those poets, Hass has real talent. The Apple Trees at Olema is a frustrating blend of banality and brilliance. This isn’t poetry, it’s a list of stuff in Hass’s kitchen. 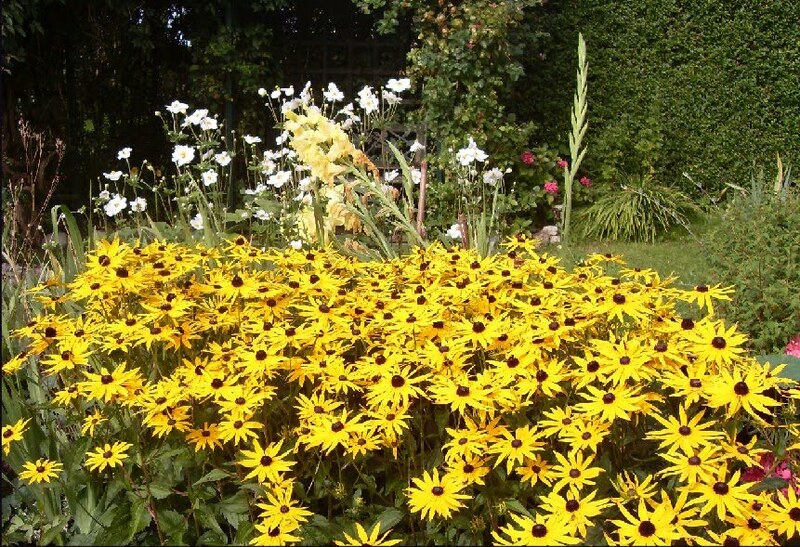 A fine day in autumn - time to tidy up the garden. I'm afraid too many plants have been given free rein in my garden. It's time for some savage cutting back. I'm inclined to let plants have their own way and this sometimes is to the detriment of the smaller more delicate ones. 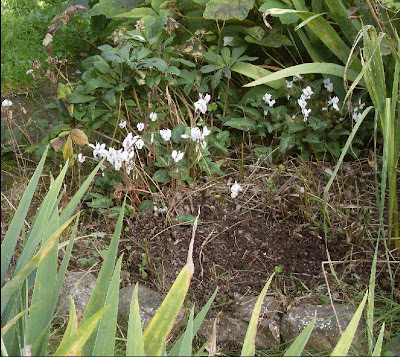 When I started to clear away foliage this week I found these - two clumps of Cyclamen Coum which I had forgotten about. No idea when I planted them but they have survived neglect and provide welcome colour at this time of year. Probably need to be moved a little towards the edge. Thursday 23rd September 2010: AN EXHALATION OF STARLINGS, poetry by Tom Conaty published by Doghouse Books, Tralee, will be launched by Seamus Cashman at 6.30pm at the Damer Hall, St Stephen's Green, Dublin 2. Everyone welcome. 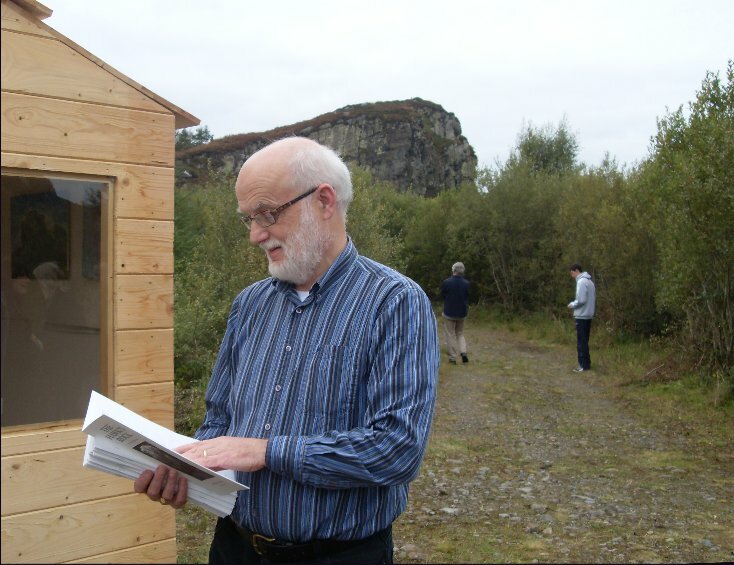 Friday 24th September 2010: The same collection will have its Cavan launch at The Courthouse, Cavan Town, Co. Cavan, where Cavan/Longford poet Noel Monahan will do the honours at 8pm. Everyone welcome. Emer and the Viaduct Bards organising readings from local emerging and established poets and writers on the last Wednesday each month at the Drogheda Arts Centre cafe/bar between 7.30-9.30pm. Sean Nos Singing Session on afterwards at 9.30pm. A group from Boyne Writers are featured on the 27 October. Emer will be reading from her new collection at the Boyne Readings and Open Mic in Trim on 21 October. 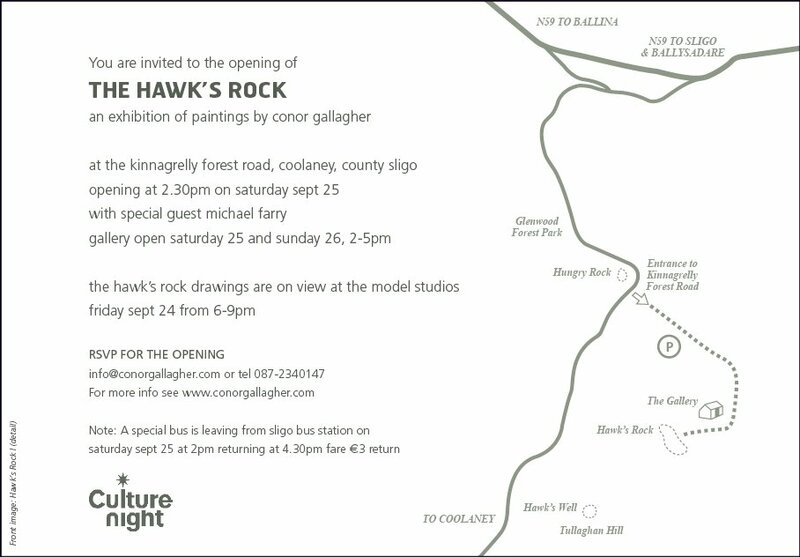 You are invited to the opening of The Hawk's Rock, an exhibition of paintings by Conor Gallagher at the Kinnagrelly Forest Road, Coolaney, County Sligo. 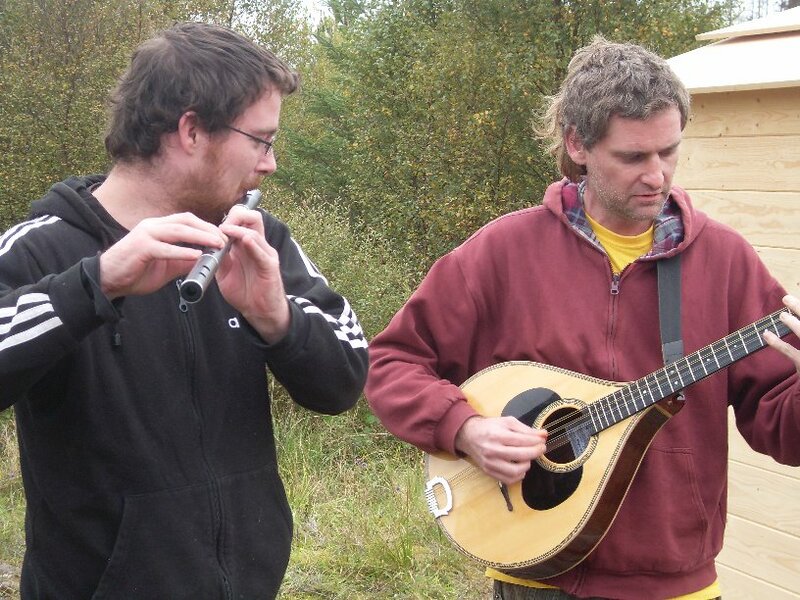 Opening at 2.30pm on Saturday Sept 25 with Special Guest Michael Farry. Gallery open Saturday 25 and Sunday 26, 2-5pm. A special bus is leaving from Sligo bus station on Saturday Sept 25 at 2pm returning at 4.30pm fare €3 return. Click here to see map and the invitation online (pdf). 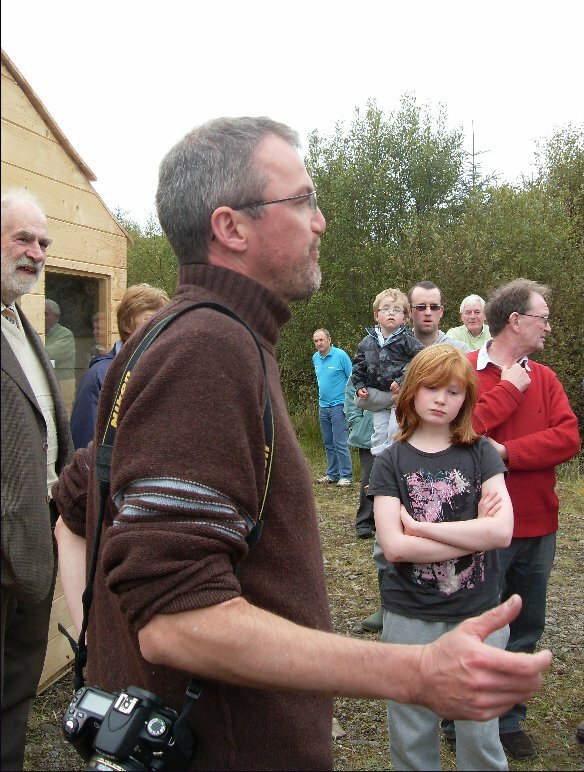 My involvement came about when Conor asked me, as a local historian, to contribute some history. I mentioned I had written a series of poems on the area so I'll combine history and poetry on the day. Conor, a graphic designer and fine artist from Sligo, did a similar project last year at Dooney Wood, Sligo for Culture Night which appears to have been a great success. Full details are on his website. Graiguenamanagh Tourism are pleased to announce the 8th Annual Graiguenamanagh 'Town of Books' Festival, which will take place in Graiguenamanagh, Co. Kilkenny, on Friday 17th, Saturday 18th, and Sunday 19th September 2010. 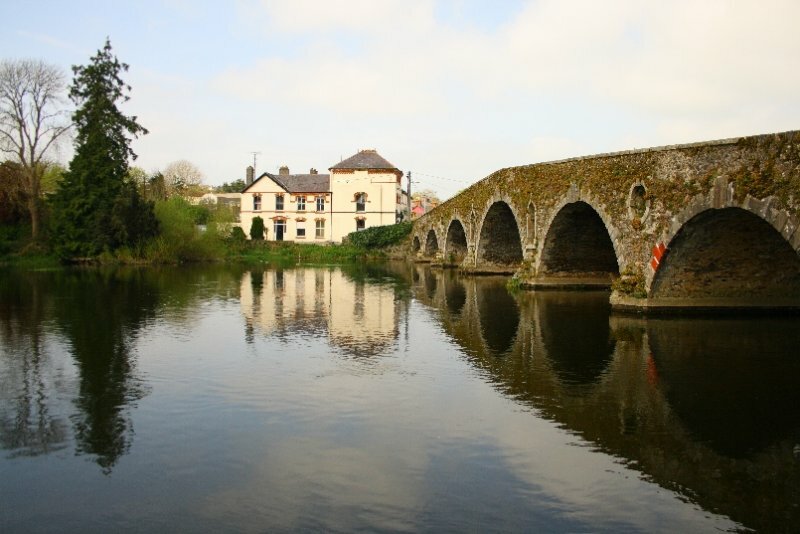 For one weekend in September Graiguenamanagh will be transformed literally (no pun intended) into a ‘Town of Books’. Whether you are looking for a special book, out of date and out of print, first edition or author signed, or whether you are looking for bargain books at great prices, then Graiguenamanagh ‘Town of books’ is a must for you. And this is only the beginning. The establishment of this festival has resulted in a permanent antiquarian bookmarket being established in Graigue, and more bookshops are being planned for the future. As well as all that, the weekend will feature lots of music and entertainment and a brilliant food and craft market on the Sunday. 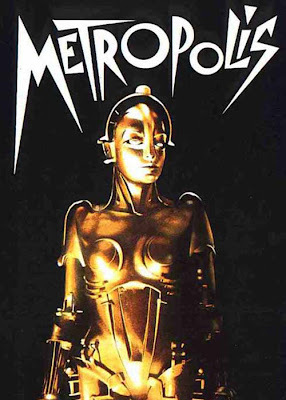 I went to see Metropolis this week in the Irish Film Institute. Made in Germany in 1927, directed by Fritz Lang this is one of the high points of what we call "silent movies". It's silent only in that there is no dialogue. The soundtrack is a new recording of the original score which is wonderful. This is a restored version of the film with newly discovered material added. If you think silent movies mean only silly cops running madly around or a poor tramp trying to win the girl then go and see this. Great sets, great special effects, over 30,000 extras and a dark vision of the modern world. 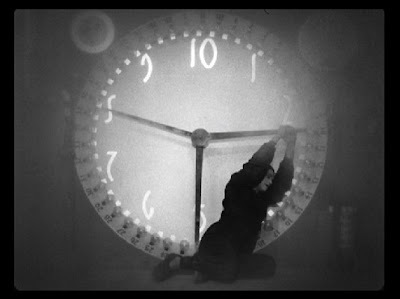 It has elements of Soviet revolutionary films (I've never seen so many flights of stairs in a film and crowds of almost-liberated workers rushing up and down) the Hunchback of Notre Dame, Tim Burton's Gotham City, a mad scientist and an evil robot. And there is a tender love story as well. 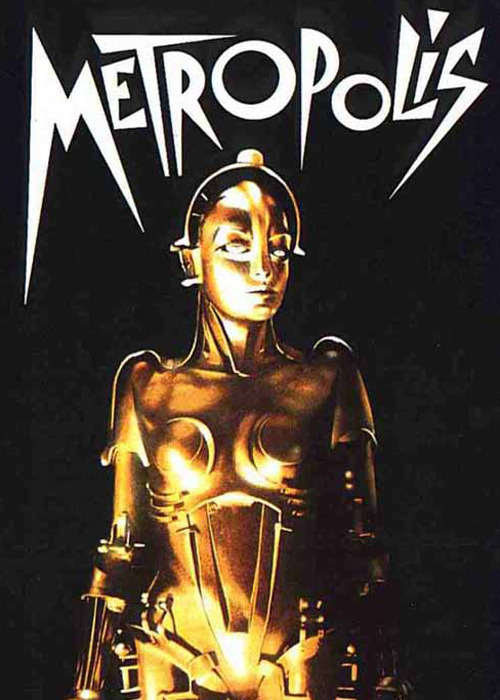 Metropolis was the grandest, most spellbinding spectacle of 1920s silent European cinema and is still worth seeing. It's long though but after the first hour you just get caught up in the mad rush, the implausible storylines and the brilliant imagery and imagination. Reviews here and here and here. You can see some of it on Youtube but it's not the same. Needs to be seen on the large screen. Tom MacIntyre Literary Weekend Sept 24th to 26th. Bailieborough, Co Cavan. Livin Dred Theatre Company. A Rehearsed Reading.with leading pofessional actors. Good Evening Mr. Collins by Tom MacIntyre.Directed by Padraic McIntyre.VENUE: Bailieborough Courthouse. What Happened Bridgie Cleary by Tom MacIntyre. Directed by Padraic McIntyre.VENUE: Courthouse. Meath County Library Services are holding a Readers and Writers Day on this day week, Wednesday 22nd September from 9.30am – 5pm in Navan Library. This is a free event for all borrowers to hear from authors such as John Boyne, Claire Kilroy, Tom French, Kevin Power, Sarah Webb, Roisín Meaney and Ciara Geraghty. Sessions include What's Happening in Irish Publishing Today; From Blyton to Landy - Changed in popular children's fiction over the Years; The Cinderella Story - The Growth of Irish Women's Fiction. Book at Navan Library on 046 9021134. Labels: Meath County Library Services; Readers and Writers Day; John Boyne; Claire Kilroy; Tom French; Kevin Power; Sarah Webb; Roisín Meaney ; Ciara Geraghty. 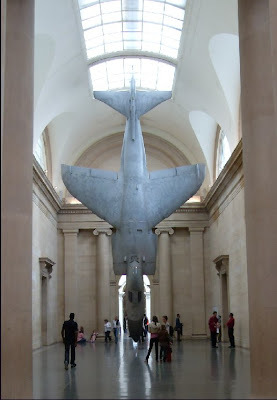 Photographs from Fiona Banner's current exhibition or installation in the Tate Britain from my recent visit to London. A remarkable experience to see these two once powerful war machines, a Harrier and a Jaguar, lifeless and helpless, one suspended like a turkey waiting to be plucked and the other stretched as on a slab. 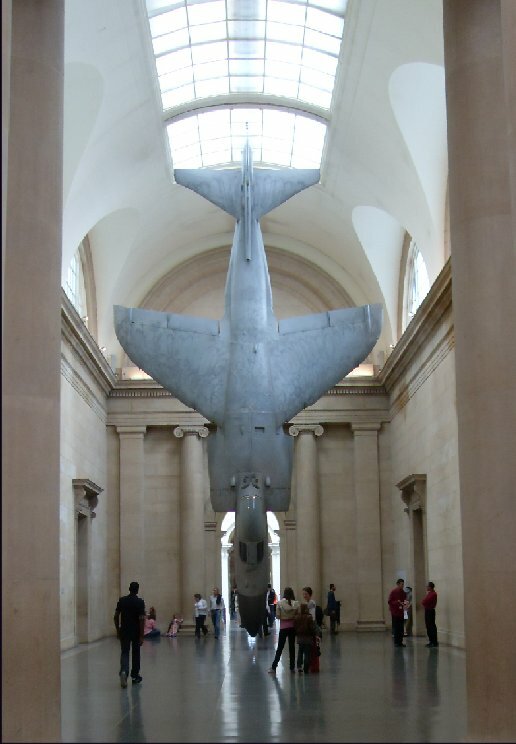 The artist, who is new to me, is interested in fighter planes and has used models and drawings to create art. 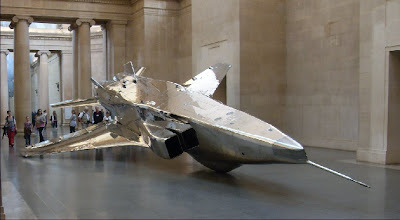 This time she used two decommissioned planes which had to be taken asunder to be taken into the gallery. Her website has an interview about the project. The Pools Of Light Poem Kevin Connelly, Kells Road, Kilkenny. Well done to all mentioned above. Second prizewinner Nuala Ní Chonchuir has had a very good weekend having got two excellent reviews for her novel You in Saturday's newspapers. Congratulations to blogger Stammering Poet also. It's been a very good year for him. Prize-giving for Black Diamond Poetry Competition will be held on Saturday, September 25 at 10:00 am at Discovery Park, Castlecomer, Co. Kilkenny. Great titles to all those poems. Hmmm maybe that's where I went wrong! The autumn flowers have survived the recent rains well. The Rudbeckia and the Japanese Anemone are still bright though the Gladioli have been knocked about a bit. Some have fallen, some just bent a bit. I forget whether I planted the Gladioli this year or whether they are some that survived from last year. Either way they provide some vertical colour at this time of year. The other two have been in the garden for some years now, need very little care and just expand each year. Ideal for my garden though they probably need to be curtailed a bit. I've got this award from very versatile blogger Niamh, thank you! I have to list seven things about myself. Here goes. 1. I was born in the first half of the last century of the last millenium and go to Mass every Sunday. 3. Nuala O'Faolain read a poem of mine on Radio Éireann in 1969 or early 1970. I didn't get any money for it and no you can't see it, I don't have it any more. I didn't write any more for 34 years. 4. I think Dundrum Shopping Centre is the worst of its kind. Compared to it Blanchardstown is Paradise, Liffey Valley Purgatory. 5. Rex Ingram is my favourite movie director at the moment, Lillian Gish (or maybe Alice Terry) my favourite actress. 6. My favourite painting is Manet's A Bar at the Folies-Bergere or else anything by Jack B Yeats. 7. My favourite poem is Dante's The Divine Comedy or maybe How My Interest in Polish Poetry was Aroused by myself. After spending all day reading the Sligo Independent for 1912 in the National Library I headed to the Damer Hall for the launch of the two books of poetry by Bradshaw Books. What Joseph Woods from Poetry Ireland called "a technical hitch" - the fact that no poetry books had actually arrived held up proceedings for a little while and gave an opportunity of saying hello to people I knew or had met at prize-givings or had published in Boyne Berries. A full audience and the readings and launches were well worth the wait. Poet Maurice Harmon launched Roderick Ford's second collection The Green Crown. I met Roderick at a Francis Ledwidge prize giving in Inchicore a couple of year ago when he won and I was commended. Roderick has a speech impediment and likes to play a tape of himself reading rather than read live. He does however introduce each poem and this worked very well. He read seven poems. His poems are a fascinating mixture of the commonplace and the fantastic, often starting in traditional lyric style but moving into fantasy, dreams or nightmares. The figure of Christ appears in many of these but always in a form imagined afresh by the poet. There is something unsettling about them a kind of darkness waiting in the next line effect. Shirley McLure's collection Who's Counting? was launched by writer Katie Donovan. Shirley has been published in Boyne Berries and I met her at the Kavanagh prize giving, she was joint second, I was joint third. Her poems are humorous, wise and subtle comments and accounts of human relationships, love, desire, death and breast cancer. The title poem is on her website. They are full of double entendres and wit and a perfect riposte to the review I quoted from a couple of days ago from Poetry Ireland Review. It is possible to write about these things- love affairs, deaths of relations etc again and again so long as you make it new. This is what Shirley McLure and indeed Roderick Ford do so well. And the Sligo Independent 1912? Fascinating reading, everyone should have to read an old newspaper once a year. 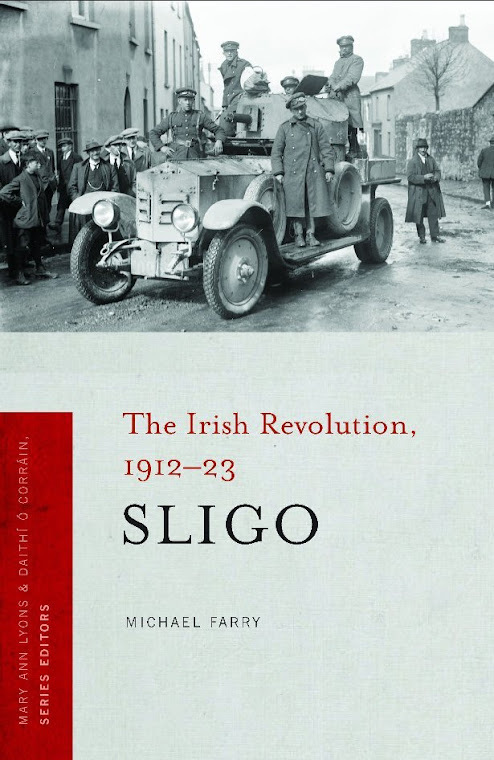 Labels: Sligo Independent; Poetry Ireland; Bradshaw Books; Roderick Ford; The Green Crown; Shirley McClure; Who's Counting? 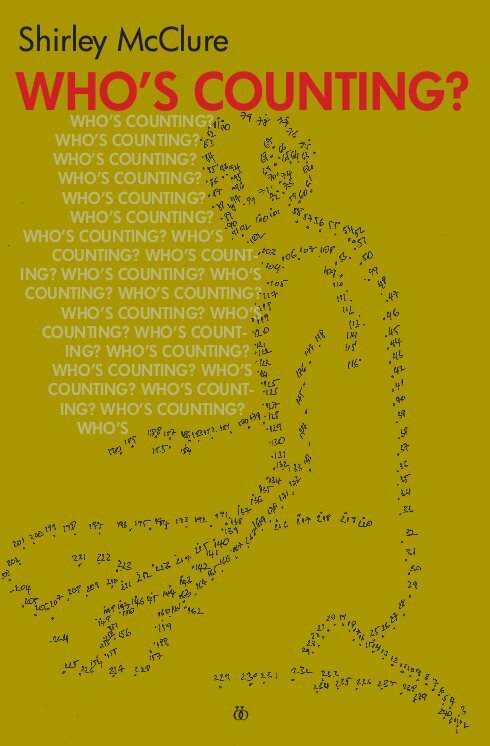 Poetry Ireland in association with Bradshaw Books presents the launch of The Green Crown by Roderick Ford and Who’s Counting by Shirley McClure in the Damer Hall, 112 St Stephen’s Green West, Dublin 2 tonight, Thursday, at 6.30pm. Shirley McClure won a joint second prize in the Patrick Kavanagh Poetry competition last year and was highly commended in the iYeats International Poetry Competition this year. Roderick Ford has won both Listowel poetry prizes and the Frances Ledwidge Award. 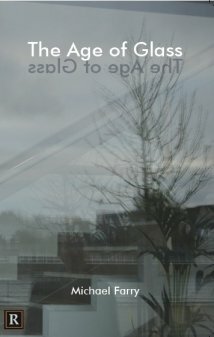 His collection The Shoreline of Falling was shortlisted for a Glen Dimplex First Book Award. The Green Crown is his second collection. Poet Katie Donovan will officially launch the volumes. Admission free. 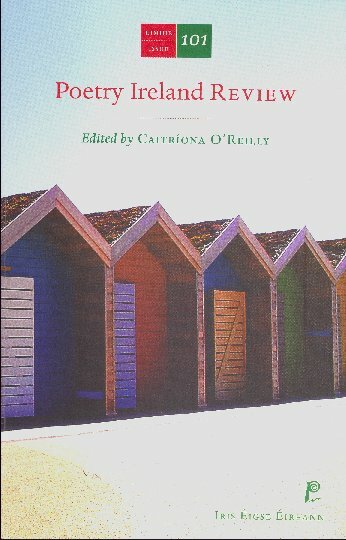 "The feminist movement in Ireland opened doors to publishing for women in an immense way but the opportunity presented was lost in a welter of bad poetry, an uncritical acceptance of anything written by a woman and a fierce resistance to any reviewer who declared (particularly if the reviewer was male) than some work was not up to much . . . What we are left with, sadly, is a welter of 'chick-lit' novels and a sad passion for poems that deal with broken love-affairs and child-birth and deceased grandparents and myths about mermaids and women-who-dance-with-seals." The latest issue of Poetry Ireland Review has a review by writer Fred Johnston of five recent poetry books which he uses to write a wonderfully opinionated piece in which he takes side swipes at many targets in the world of Irish poetry and publishing. The above quotation from the review is a good example. It's an interesting issue for other reasons also. 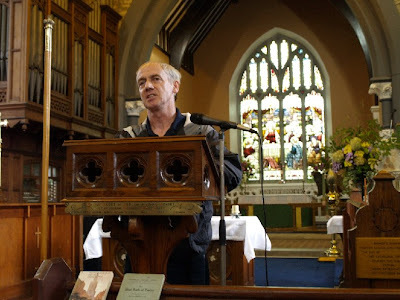 There's an interesting article by Tom Duddy in defence of Seamus Heaney and an edited version of a talk given by Belinda McKeon at Poetry Now 2010. A selection of the poems she refers to are printed in the magazine. The last poem in the magazine, by Máiríde Woods, is an hilarious riposte to the much discussed and criticised essay in Poetry Ireland 100 by Maria .Johnston. I attended the official opening of the art exhibition Lost and Found in the Solstice Arts Centre Navan, on Thursday evening. The exhibition displays some the Megalithic art found on the passage tombs of Meath, Newgrange, Knowth, Fourknocks, Tara, Loughcrew. Professor George Eogan, a native of Nobber, co Meath, excavated Knowth and discovered much of this art and he has written extensively on the Passage Tomb builders of the Boyne Valley. 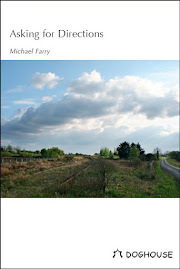 He has compiled a booklet Megalithic Art in County Meath which is available free at the exhibition. This factual study of Megalithic art of the county is balanced by the work of four contemporary artists in response to this Neolithic work. The artists are Niall de Buitléar, Fiona Hallinan, Anna MacLeod and Sabina Mac Mahon and the exhibition is curated by Brian Fay. At the official opening George Eogan was honoured for his work in excavating and studying the megalithic tombs and art of the Boyne/Blackwater valley and he spoke with some enthusiasm of the importance of the area in a European and world context - the Passage tombs of the area are older than the Pyramids of Egypt. The Meath area has more stones with megalithic art than the total found in Europe as a whole. George Eogan was one of my Archaeology lecturers in 1969/70 when I attended UCD, Earlsford Terrace as a BA evening student. 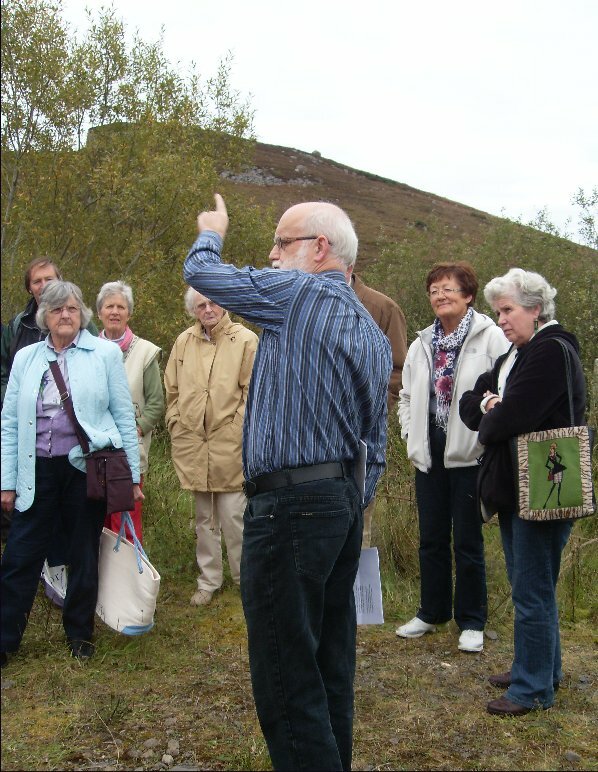 He had just discovered the two passages in Knowth and it was an exciting time to be studying Archaeology. The modern art seems to be wonderful. I didn't have time to study it in detail - a writers' meeting in Trim called and I must return. I was especially taken with Sabina Mac Mahon's work entitled: St Oliver Plunkett and the Apparition of an Angel and a Tailboard Camera at Loughcrew Cairn T on Carnbane East. She specialises in works which involve photographs. Top: Art on kerbstone 52, Newgrange. 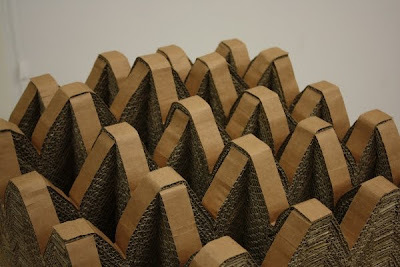 Below: Untitled by Niall de Buitlear from the exhibition. A similar piece in a current exhibition in the RHA in Dublin is pictured in yesterday's Irish Times. And in London last week I looked for a poetry reading to attend. The Poetry Cafe which has an open mic on Tuesdays was closed for August and an internet search found only one event for last Tuesday night week, a reading by American poets (also husband and wife) Robert Fitterman (above) & Kim Rosenfield in Birkbeck College, University of London. I had never heard of these two poets but a short internet search suggested that they might be interesting so I went along. About thirty people attended and I got the impression that most knew each other and that they might be attending a course at the college, possibly part-time students. The two poets were introduced as writers of conceptual poetry. What is this? A definition is difficult, but it often means that the poet uses found texts to create a poem. Fitterman, for instance read a poem of his which consisted of a list of businesses found in a shopping mall - Burger Kind, Body Shop, Dunkin Donuts etc. Each verse was made up of the same list in a different order. 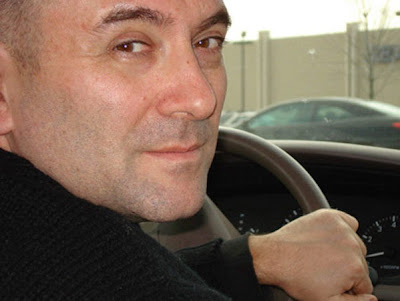 He writes a lot about cities and shopping malls - he has published three volume of Metropolis, a poem-project he has been working on over the last ten years or so. There is a video of a reading by him here. He read some of the same pieces in London. He has got rid of the beard! Lots of him reading at PennSound on this page. One of his projects at the moment is to find a real person on the internet and select pieces of texts, facebook comment, tweets etc by this person, other people of the same name and their friends and put those texts together to create a poem. He read some which included an email from himself to the person and the reply. Fascinating stuff. And Kim Rosenfield? Completely different conceptual poetry, much less immediately understandable but a great reading style which involved reading pages each of which contained a line or two of each poem. She reminded me of C D Wright who really impressed me when I saw her at the Dun Laoghaire Poetry Festival a couple of years ago. You can hear and see Kim Rosenfield here. Her page on PennSound is here. An enjoyable evening. Poetry can be many things, not just neat packages of fine sounding accounts of remembered incidents with thinly disguised lessons or sensitive anecdotes dotted with the personal pronoun, first person singular or embarrassing personal revelations (the kind of poems I entered in Over the Edge this year. I wonder how they'd like some conceptual stuff?). 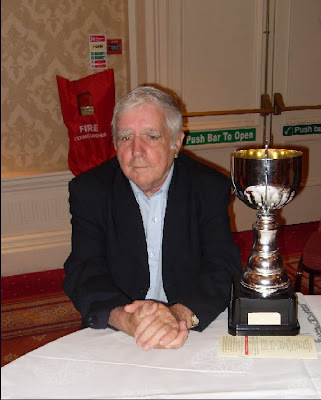 Trim poet wins the Poet of Fingal title! No not me, Tommy Murray for his poem, Lottery. Doesn't he look pleased! First the Meath Writers Circle win the Battle of the Books and now this. There will be no standing them at the Boyne Readings! This is the third time Tommy has won this competition and brought the impressive trophy to Trim. Second was Aine Lyons and third John Flynn. I attended the presentations of the Annual Literary Awards at Swords Heritage Festival last evening at The Carnegie Court Hotel, North St., Swords. A big crowd, good company, nice food but no award for my 100 line poem. Entering a long poem not a good idea! Awards were presented in the Short Story Competition, the Poet Of Fingal Competition and the "What Swords Means To Me" Contest by Councillor Ken Farrell, Mayor Of Fingal. Trevor Sargent TD also attended and spoke. The Short Story prizewinners were 1. M Hughes, 2. Anne Lawlor and 3, Christopher McGeogh.